Lilies are inundated with rich and historic meanings. These symbolic meanings derive from folklore and early civilizations across the world. Many of these lily symbolism are based in religious context, as the lily is deeply associated with virtue and the image of the Virgin Mary, but there are widespread secular associations as well. Symbolism can also be found in the language of the Tarot. Because the lily can be found in so many colors, the flower takes on meanings for each variation; however, the most common meanings of the lily are innocence, purity, pride, vulnerability, and transformation. When seen in tarot, the lily flower is thought to symbolize the purity of self. It is also thought to be sign of personal development and health. The context of the surrounding cards can provide deeper and more specific meanings to the image of the lily, such as rebirth, the budding of a new friendship, or an upcoming period of self-discovery. In reference to religion, the Easter lily is often viewed as the image of chastity. In religious contexts, a white lily is a symbol of the Virgin Mary. It’s white petals are representative of Mary’s virginity and purity. Lore states that white lilies were found at the site of Christ’s crucifixion and provided a sign of his upcoming resurrection. For this reason, lilies are often symbolic of the spring and the beginning of new life. The color of the flowers petals play a big role in its symbolic significance, as different colors hold different messages. These messages are often taken from the symbolic meanings of colors. For example, the orange lily is thought to represent passion while the yellow lily represents merriment. Pink lilies are suppose to signal prosperity. Some variants of lilies include the Easter lily and Lily of the valley. The latter is a sweet-smelling but highly poisonous wildflower that, somewhat ironically, is thought to represent a tender heart and serves as the flower given on a 2nd wedding anniversary. Because of its refined beauty, lilies are a commonly used for gifting purposes. They are the traditional gift for a 30th wedding anniversary and are meant to symbolize devotion and dignity. This is especially appropriate because of the additional association of promise and passion that is often attached to the lily. The lily flower is a delicate and exceptionally elegant vision, and therefore acts as the perfect reminder of the beauty and hope that surrounds us everyday. Meditating on this flower can help to improve our awareness of the positive things in our life. It can also remind us of the importance of being pure of heart. 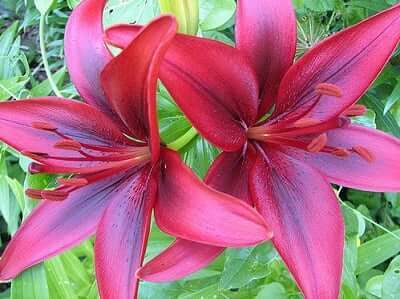 Lilies implore us to get rid of the negativity and focus on the positive. Remember that the lily is symbolic of transformation, and by allowing ourselves to let go of the pain, we can make meaningful changes and even achieve greater self-love. The messages of the lily is especially important when entering a new relationship because it urges us to be totally devoted. Lilies will tell us to love innocently and deeply. We are reminded not be afraid of being vulnerable with other people in our lives. There are many messages and meanings that we can gain from these beautiful flowers, so be sure open yourself up to explore these lessons. You might even find yourself in a place of satisfaction.